One of the premier coin dealers in Norco , California is Markham Numismatics. As a coin expert, we are experienced in coin grading; including gold coins , and silver coins, and examining and appraising rare coin collections. 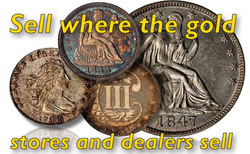 We have been Norco areas coin dealer for over 30 years and we have unsurpassed knowledge of coin values and coin prices. First of note is our accreditations as rare coin appraisers. Markham Numismatic is an officially accredited BBB Coin Appraiser . we have the experience of 30 years, as past grader for the Professional Coin Grading Service. Because of this, other dealers come here to sell coins. So come sell where the dealers sell! Markham Numismatic is a smart place to sell coins.because we have unsurpassed knowledge of coin grading and coin values. Furthermore, Markham Numismatics has a network of coin collectors. All of these aspects make Markham Numismatics the most attractive option for selling valuable coins. To engage their services, a customer merely needs to call for an appointment in our private and safe office. In home appointments are available if the client wishes to sell larger collections. With all the advantages offered and the ease of access, there is no reason not to sell your gold coins, silver coins, and rare coins at Markham Numismatics. "I and my Wife have done business with Howard Markham and found him to be very friendly and honest. We have turned in gold chains and other items and were very happy with the way we were treated. We would highly recommend him and his company. If you are looking to sell or buy we and our friends have found him to be very honest."